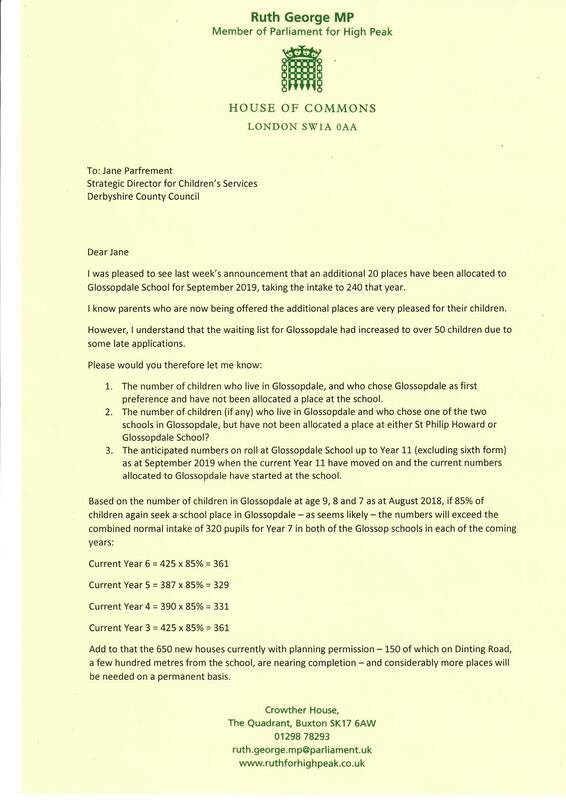 On Monday I wrote again to Jane Parfrement, Derbyshire County Council’s Strategic Director for Children’s Services, welcoming the additional 20 places the council had made available at Glossopdale School – see my letter below. I also sought further information about the council’s plans for future years, here is the reply I received. Thank you for your email of 1 April 2019. We are also pleased to have been able to offer additional places at Glossopdale with the co-operation of the school. 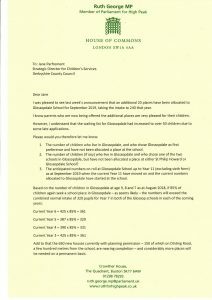 The waiting list at Glossopdale did increase to 50 at one point but it should be mentioned that the Glossopdale list is maintained for any pupil who has the school as a higher preference than the place they have been allocated. In many cases they have been offered and accepted places at one of their other choices, however, they remain on the list until the full admissions process has been completed and that includes waiting for the outcome of appeals. 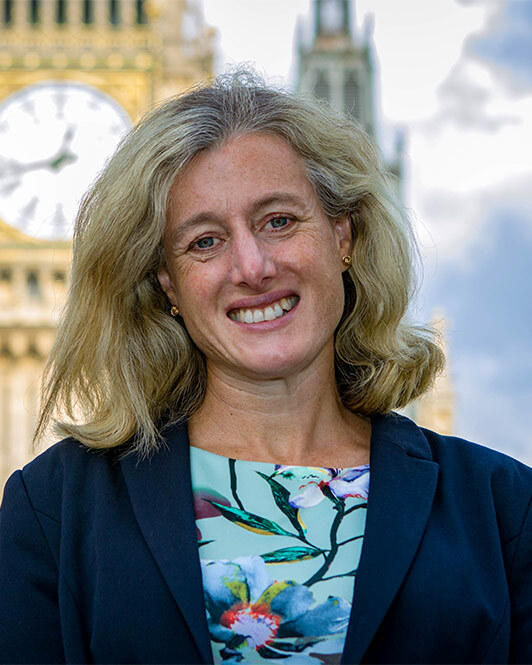 Whilst the Authority makes every effort to meet parent’s first choice, that is not always possible although, as an Authority, we have a high success rate at 92.3% which compares favourably with other areas of the Country. 96.5% of parents receive one of their three preferences and that again compares well with other areas. 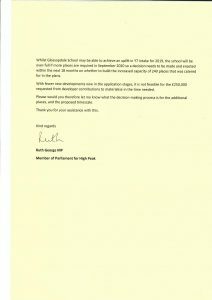 To answer your specific questions, the number of children who live in Glossop who chose Glossopdale as a first preference and have not been allocated a place at the school is 13 including one late preference, however, three of these are under offer at present so the number could fall to ten. 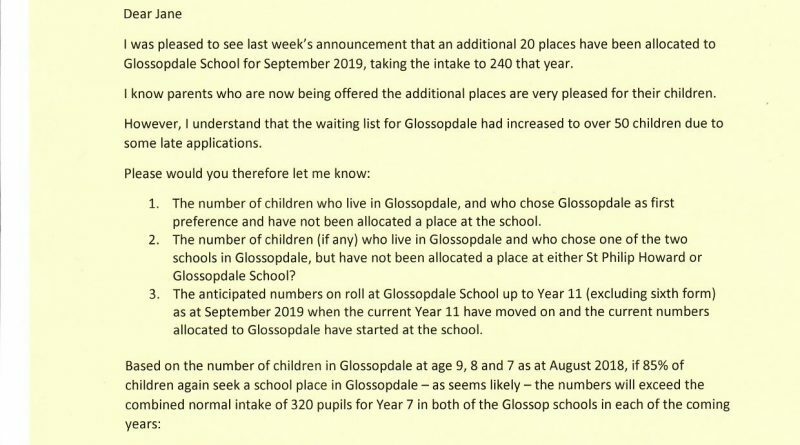 The number of children who live in Glossop and who chose one of the two schools in Glossop, but have not been allocated a place at either St Philip Howard or Glossopdale is five, however, none of those applications included St Philip Howard as one of their preferences. All those that did, received a place there. There is a concerning trend for parents to only offer one preference in the mistaken belief that it increases their chance of receiving a place at that school. On the original waiting list, there were 11 parents that only provided one preference, i.e. 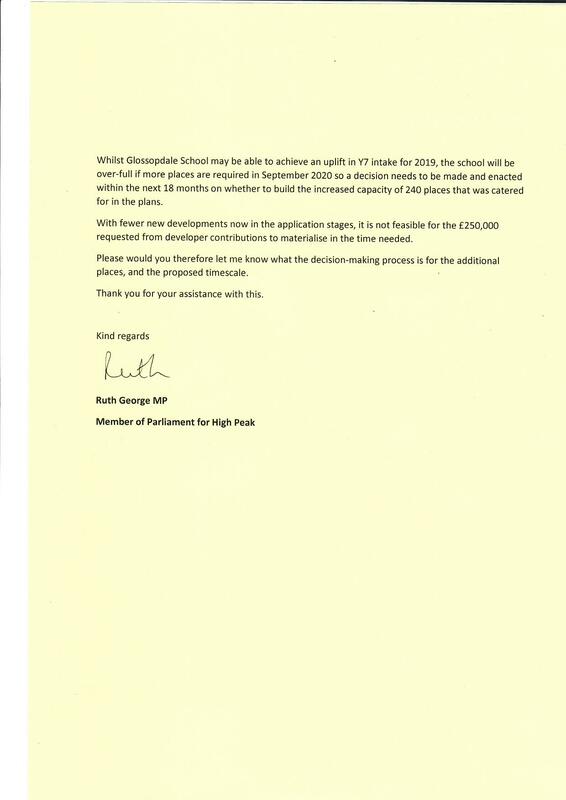 for Glossopdale and that reduced the chance of them being offered a place at the alternative school in Glossop. Nine of the children that were originally offered places at New Mills were in that category. The anticipated number of pupils on roll (years 7 – 11 only) at Glossopdale in September 2019 is 999. The numbers you have quoted for future years do exceed the total published PAN for the two schools, however, the net capacities of the schools sit within a range and it is that flexibility that has allowed both schools to exceed their PAN this year. The Authority reviews its basic need for each school every year on completion of the revised pupil projections in April. The new set of pupil projections have just been completed and the Authority will carry out the review using projections and the housing data in the next three months and that will inform any decision about the expansion of the school. I will, of course, keep you informed about our progress.